White Dwarf #44 was one of my favorite issues. I am not sure why that is exactly. Maybe something to do with the cover. Needless to say I love her totally 80's hair. And I am not sure that her armor is actually doing much. This cover is like a combination of Tolkien and Heavy Metal Magazine. Tolkien that is if this some alternate 80's reality version of Middle Earth. I would though like a better copy of this art for my game room. I have to admit I am a bit confused. I am unsure if this cover was done by Alan Craddock (as I assumed) or Jim Burns (who is listed as the cover artist). Like a lot of art from this time it seems to pop up in other places. Cheesecake aside there are a lot of things in this magazine I used; so page for page this was the most useful issue for me. This was the height of White Dwarf's golden age for me. This is also the issue that almost got me back into Traveller with it's nice big full color ad. Let's jump in and see what August 1983 has in store for us. In the editorial Ian Livingstone talks about the changes that will conclude come issue #45. Among other things we are getting the first comic of Thrud the Barbarian. Marcus Rowland has a new idea for moving the plot along in Traveller with ICE, the Interstellar Charter Enterprises. Nice idea for some independent operators in Traveller that beats the stand by "You all met in an inn a spaceport when...."
Open Box gives us some classics. First up is the The Shadows of Yog Sothoth. Which gets a rare, but in my mind deserved, score of 10/10 from Ian Bailey. Steve Jackson continues the mini-game line with a company defining game. Not GURPS, but Illuminati. Phil Masters only gives the first two sets a 6/10 each, disliking some of the rules and complexity. Marcus Rowland steps away from Traveller to review two Endless Quest books and is not impressed. Reviewed are Revolt of the Dwarves and Revenge of the Rainbow Dragons, each only getting a 5/10. Finally Jim Bambra reviews what is destined to be some of the last of the "Golden Age" of the TSR modules. He gives high marks to S4 (9/10) and WG4 (9/10) which I agree with. He also likes N1 and U2 (8/10 each). Critical Mass has a bunch of new books to review, or at least mention. This was the great age of 80s Sci-Fi and the OtherWorlds club. I remember then not begin able to read enough. Oddly enough the article bemoans the lack of good Sci-Fi and fantasy, or at least the lack of attention on new good books. I know that at age 14 I did not have a very advanced or sophisticated palette but I don't recall it like this. Lew Pulsipher is up next with an article I have read and reread hundreds of times. True Sight is all about realism in your games. In the time following this I was all about realism. I wanted to know where the arrows hit, what the GDP of a country was in GP and how did adventurers factor into that. All that. I have since given all that up and now just enjoy the moment of the play. But this is still a great article. Not on realism, but what realism means to you and your game. Charles Vasey is next with the bi-monthly Board Games column, Counterpoint. This one cover the Sanctuary Board game based on the then uber-popular Thieves World books. I loved Thieves World and gladly grabbed anything I could. But this gem never made to my stores (which were still just book stores). Vasey also covers the Consulting Detective game. Interestingly enough at the time that had no interest for me. Today it is the other way around. Dave Morris has Dealing With Demons in RuneQuest. I cannibalized this article for all sorts of ideas for D&D. There have been better articles on the subject since, but none grabbed my attention quite like this one. Yeah at 14 in the middle of the Satanic Panic in the Midwest I was devouring articles about summoning demons in D&D. The article is long and only the first part, but I used every bit of it. Microview has more software for us. A Zx81 BASIC program for AD&D or T&T combat. At only a couple score lines it doesn't really do much. Still though I loved it. Irilian is back with part 3. Only 3 more to go for the complete town. RuneRites has some new monsters for RuneQuest, a first really. Only two, a Kirin and a Golem. But since they had analogs with monsters in D&D it gave me my first taste at converting some monsters from one system into D&D. Since I didn't have any other monsters these both became a demon type for me to use with the Dealing with Demons article. Fiend Factory is back with Tribal monsters. We have an odd dragon/centaur like race call Wodennians. Never used them because I thought they looked silly. We have a race of "Evil Halflings of the Underworld" called, of all things, Blacklings. I liked the idea but HATED the name. Even then it struck me as stupid. I used them, but I made them pale like what you would expect a race that lived underground to be like. Some of those ideas later were worked into my ideas for Drow. Intitally I hated the next creature, the Wohk, because they seemed dumb and I didn't like their spontaneous regeneration. But over the years I have come to like them as something so odd it could only work in D&D. Yelgs are like Green Orcs and some of my first orcs of my world were green. It may surprise some but my first character was a cleric and I enjoyed the hell out of playing him. So when I got a copy of Graeme Davis' Seeing the Light article I went about trying to convert everyone to my cleric's religion and gaining XP for it. I did it so much in fact that if you read my witch books now you will notice that one of the things about witches is they DON'T try to convert you. More ads and classifieds. Another Gobbledigook strip. Again, it is not understating it that I milked this issue for everything it had back then. I mentioned above that this particular bit of cover art had been reused. Here are a couple of examples that appeared after this cover came out. Here is one for an Irish 80s Metal Band Blackwych.. Which of course begs the question "Why have I not heard of these guys before??" 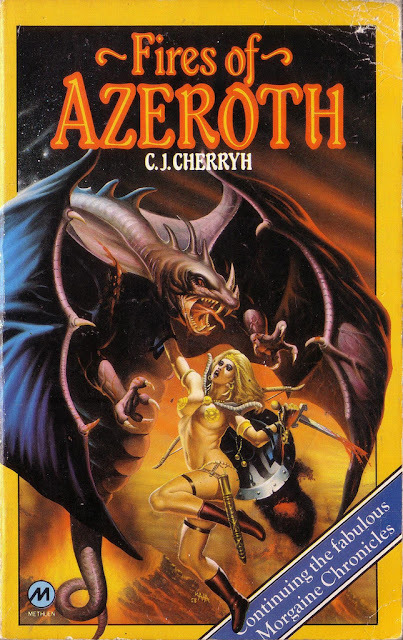 And the cover for "Fires of Azeroth" by C. J. Cherryh. No. It has nothing to do with WoW. I have no problem admitting that I created a character solely based on this cover. Ok I gave her better armor. Also she was a character that most everyone else hated in my games, but changed the course of not only my 80s D&D game, but also my 2000s Buffy/Willow & Tara games. Yeah, that image was the source of my inspiration for Morgan Ebonflame, the Hunter of the Dead and the Daughter of Death. She was a PC in games I played and an NPC in games I ran in my group's shared world. I find it interesting that the C.J. Cherryh's book was part of the "Morgaine" series and my character was named "Morgan". That is one of those weird happenstances, but I don't rule out that I had seen this cover sometime in the mid-80s. I would have rolled up Morgan around 1985 or so. Yeah I saw the Alan 82. I don't know enough about either artist. Yeah, I'm sure it's not Jim Burns. Too many stylistic differences. As you'll know from my White Dwarf review series on ENWorld, I love the RQ demons series, although this part is mainly the crunch - the fluff in the next two/three issues is what really sold it to me. As for the cover, I'm not surprised that it crops up as a book cover since a lot of the WD cover artwork seems to come from a stable of publisher's covers. There are couple coming up that feature on the front of the Harold Shea stories.